Harlem-based WE ACT for Environmental Justice established an office in Washington, DC in 2012 to advance the federal policy needs and interests of its Northern Manhattan community. 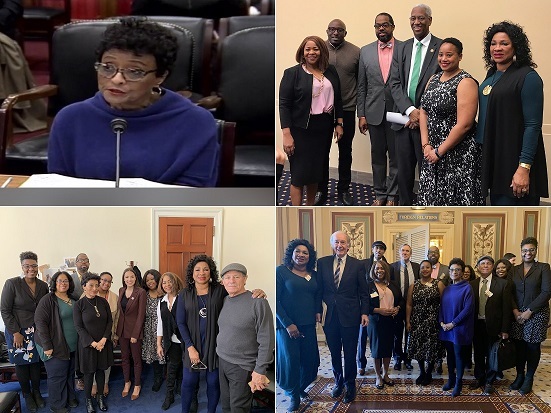 Our Federal Policy office works with lawmakers, agencies, and other organizations to advocate on behalf of environmental justice legislation and policies. 1991: Participated in the first National People of Color Environmental Leadership Summit, helping create the Principles of Environmental Justice. 1994: Participated in the signing ceremony of the President’s Executive Order 12898, to focus federal attention on the environmental and human health effects of federal actions on minority and low-income populations with the goal of achieving environmental protection for all communities. 1994: Participated in the ground-breaking National Institute of Environmental Health meeting in Crystal City, VA that launched community/university partnership grants. 1996: Worked with the US Environmental Protection Agency (EPA) to conduct the first assessment of Northern Manhattan’s air quality, revealing that harmful particulates were more than 200% higher than the air quality standards. 2001: Participated in a national review panel on the second edition of EPA’s major report, America’s Children and the Environment. 2002: Organized a national conference on the ethical and social implications of genetics research in communities of color, which drew 400 participants. 2008: Established the Environmental Justice Leadership Forum to strengthen the capacity of environmental justice organizations to address and impact climate and energy policy at the national level. 2009: Hosted the first two-day national conference on climate justice which was attended by more than 400 participants. 2012: Established Federal Policy office in Washington, DC. 2012: Campaigned to support the EPA’s more stringent “Soot Rule,” which regulates particulate pollution (the PM 2.5 Standard). 2015: Worked to get the EPA to issue guidance on incorporating environmental justice into the Clean Power Plan. 2016: As part of the Safer Chemicals, Healthy Family coalition, participated in the reform of the Toxic Substances Control Act, the Nation’s primary chemicals management law, which resulted in the Frank R. Lautenberg Chemical Safety for the 21st Century Act. 2017: Brought more than 160 community members to the 2017 People’s Climate March in Washington, DC. 2017: Published Unequal Air and Care: Federal Impact on Pediatric Asthma Disparities in 4 U.S. Cities, an in-depth report, which draws on community-based research in four states to provide concrete recommendations and call for strengthening of the 2010 Coordinated Federal Action Plan to Reduce Racial and Ethnic Asthma Disparities. 2017: With the Environmental Justice Leadership Forum on Climate Change, published the Cleaner Air, Cleaner Communities: 6 Steps to Develop Environmentally Just State Implementation Plans, a step-by-step resource to integrate environmental justice considerations into State Implementation Plans of the Federal Clean Air Act. In addition to driving WE ACT’s federal policy agenda, the office also serves as the administrative anchor for the Environmental Justice Forum. The forum is an alliance of environmental justice organizations working together to advance climate justice and impact policy to ensure the protection and promotion of communities of color and low-income communities throughout the United States. The EJ Forum was initiated in 2008 in response to the emerging concerns around possible mitigation strategies and regulations that were being presented as options to reduce greenhouse gas emissions, had the potential to amplify the disproportionate environmental burden on communities of color, and/or low income. Our Federal Policy office is staffed by Kerene N. Tayloe, Esq., Counsel/Director of Federal Legislative Affairs and Communications Manager Dana Johnson, and is supported by Cecil Corbin-Mark, WE ACT’s Deputy Director and Director of Policy Initiatives, in the New York office. And we are in the process of recruiting a National Campaign Manager.